The time for agonizing is over. It’s college decision day which means the parents of high school seniors have little time left before they must put down their college deposits. One dad emailed me to ask my advice about whether his daughter should attend the University of California, San Diego or the University of Redlands. I told the dad that Redlands would provide his daughter with a more personalized education with small classes and the opportunity to know her professors. The likelihood of that happening at UCSD is low. That said, research universities that offer an honors college can be a great choice for students who are brilliant enough to qualify for admission and who also want a personalized education at a large school. At the end of the day, UCSD enjoying a more recognizable name doesn’t mean anything. Research institutions will always be better known, but that hardly makes them a superior choice for undergrads. A dad from Los Angeles called me today to ask if there was any way he could extract more money from Northeastern University, which was his daughter’s first-choice school. His daughter applied to about 10 schools – some with more generous packages – but he agreed she could go to Northeastern. I told him that unfortunately Northeastern is typically a stingy school. Below the elite level, a lot of universities located in cities on the East Coast give miserable financial aid packages. Why? Because they can. Because so many students flock to these schools, they don’t have to be generous. Northeastern, by the way, only meets 69% of the typical student’s financial need and that includes a loan! NYU, American, Drexel, Emerson, Fordham, Catholic are among the other stingy schools. Do You Need a Coop Program to Get a Job? I also heard from a mom yesterday whose son was still on the fence about where he was heading. The bright kid from the West Coast got into Vanderbilt, Northwestern and Tulane. Tulane gave him a the biggest merit scholarship — $27,000, but the family wondered about the strength of the program post-Katrina. Ideally, the young man would have talked with engineering students at Tulane to get an idea of whether the engineering program is a solid one. If they know what their major is, I always recommend that high schoolers ask students in a particular academic department their opinion of the program. I also worry about a mom who appeared willing to let her daughter go ahead and enroll in a six-year pharmacy school. I was shocked when the mom, via email, told me that her daughter would have to borrow $27,000 a year. I responded that her daughter would be committing financial suicide if she followed through with her plans. After that warning, I didn’t hear from her again. What parents need to understand is that there is no one right school for their child. Students can flourish where ever they land. I can provide my own example. When my daughter was in this position five years ago, she was deciding between Juniata and Dickinson colleges, which are both lovely liberal arts colleges in central Pennsylvania. My husband and I thought Dickinson would be the better fit because of my daughter’s interest in majoring in Spanish and international business. Language and international studies are Dickinsno’s huge strong suits. Caitlin picked Juniata instead and it turned out beautifully for her. She adored the chairman of Juniata’s small Spanish department, she spent a year at the University of Barcelona, she majored in business and Spanish and ended up back in San Diego with a great job at a toy company (Rokenbok), where she is busy creating videos and is generally knee-deep in the toymaker’s social media strategies. Parents – don’t stress too much about this decision! 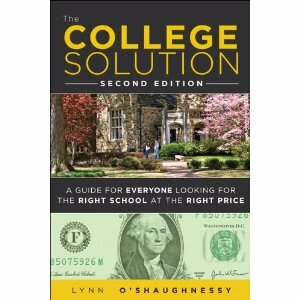 Lynn O’Shaughnessy is the author of The College Solution: A Guide for Everyone Looking for the Right School at the Right Price that’s hot off the press. It was released over the weekend! If you’re going to be in sunny San Diego on May 12 and/or May 19, I’d urge you to consider attending one or both of the college workshops that I will be holding through the University of California San Diego Extension. At the workshop on May 12 I will share ways to make college more affordable while at the workshop on May 19 I will focus on academic and admission issues. You can learn more about the college workshops here. Actually, Tulane HAS a 3+2 program in engineering with Vanderbilt and Johns Hopkins. Students spend their first three years studying engineering at Tulane, then head to Vandy or JHU for their engineering degree. For a student who wants engineering, it is true that Tulane scaled back its engineering offerings after Katrina. But, the 3+2 program offers additional options.